Security startup Terbium says it can find stolen data in the dark corners of the Internet by using data fingerprinting techniques. The company is called Terbium Labs, named after a malleable, silver-gray element. CEO Danny Rogers and CTO Michael Moore say they're taking a large scale, computational approach to finding pilfered data. 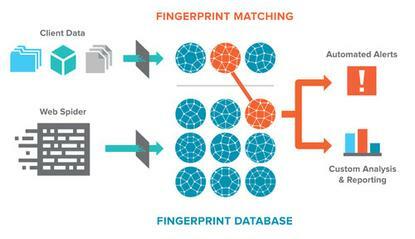 Terbium's product, Matchlight, uses data fingerprinting techniques to create hashes of an organization's data in fragments as small as 14 bytes. Only those hashes -- which can't be transformed back into the original data -- are stored by Terbium. The other major component of Terbium's service is a massive private index of the so-called Dark and Deep Web, both terms for hard-to-find websites and crevices of the Internet where cybercriminals trade and sell data. The hashes collected from companies by Terbium are then compared with data shared on the Web, "which is a way for us to automatically search for an element of the company's data without actually knowing what that data is," Rogers said. "The number one concern for information security folks at these large enterprises is control and protection of the data, even from their own vendors," he said. "So this allows them to search for things without having to reveal what those things are." Because the hashing and comparing is done in real time, the company said it can shorten the breach discovery time -- which in some studies ranges up to six to eight months -- down to minutes. Companies can choose what applications or data stores they want Terbium to monitor. If Matchlight finds something similar on the Dark Web, it can score it, which gives an idea of how similar it may be to the company's data. Terbium spiders and indexes obscure parts of the Web, such as Tor hidden services, which are websites using the anonymity system to obscure the sites' real IP addresses. Hidden sites are increasingly favored by hackers, as it makes it harder for law enforcement to track. The indexing system naturally follows links posted within the Dark Web. "Where we're looking at are places where people are leaking or are trying to monetize data," Rogers said. Rogers said the first day Terbium turned Matchlight on, it found in a single 24-hour period 20,000 to 30,000 credit card numbers and 600 leaked email addresses and passwords. Both sets of data were detected minutes after being posted, Rogers said. Several Fortune 500 companies, including health insurers, manufacturers and financial services ones, are beta testing Matchlight now. Terbium hasn't determined pricing yet, but it is considering a flat rate based on data volumes or the number of records monitored, Rogers said.